In 2015, singer songwriter and power pop champion Kurt Baker capitalised on his escalating popularity in Europe by teaming up with a bunch of Spanish garage rock and bar band heroes…and Bullet Proof Lovers was born. Not so much out of necessity, but from fun, and the resulting mini-album (which had a belated US release in 2016) saw Baker tackling some of his punkiest tendencies since his days with The Leftovers. The Lovers’ proper first album very much picks up where that mini-album left off and there’s no hiding Bullet Proof Lovers’ key interests. “I was born in the gutter…with an electrified fever” spits Baker during the first verse of ‘Ain’t No Joke’, a track that gets across the band’s desire for making their audiences sweat. This fusion of pop-punk and garage rock results in a near-perfect couple of minutes – an ideal up to anything from the previous recording. Baker’s gift for hooks is at the forefront and given the faster backdrop than his solo career so often affords, his performance bristles with life. He’s almost left in the dust by guitarists Luiyi Costa and Juan Irazu, though, whose two man guitar assault combines sharp riffing with a greasy punk ‘n’ roll solo that really cuts through the main melody. The rather self-explanatory ‘All I Wanna Do’ melds a Spinal Tap theory of having “a good time all the time” to more punky finery, without losing too much of that rock ‘n’ roll spirit, while ‘I’m Your Toy’ delivers more of the same on the surface, though without sounding too much like a retread. The power pop feel of Baker’s solo work is a touch more to the fore and perhaps a little more than on those other tracks, gives an indication of how this full-length has just a touch more variety than you’d perhaps expect. In terms of chorus, this is an album highlight, while musically, the band shows off both speed and panache, with a love of The Knack and Johnny Thunders in equal measure. The addition of a rollocking rock ‘n’ roll piano is a huge plus; Kurt’s long-time friend Kris Rodgers plays up a storm…even if his contributions are very low in the mix. Lead single ‘I Am My Radio’ is both a celebration of a love of music, as well as a demonstration of brilliantly punchy power pop, placing Bullet Proof Lovers a couple of steps closer to the overlooked Lashes. Riff-wise, things are in full force, throwing out melodies that are somewhere between The Breakdowns, Hollywood Teasze and Radio Days. If you’re already familiar with Bullet Proof Lovers, you’ll find nothing new here, but the presence of an understated organ and a shredded rock ‘n’ roll solo combined with a killer hook come together to make it prime BPL fare. ‘On Overdrive’, meanwhile, churns out some classic muted riffs, with everyone excelling at a power pop/post punk crossover – the kind that takes its main thrust from the likes of old Undertones tunes and Joe Jackson’s classic ‘Got The Time’. In and out in just over two minutes, there’s no flab…just power and passion. Elsewhere, ‘Can’t Let Go’ makes great use of chopping riffs and an excessively fuzzy lead sound that catches the ear straight away, but the inclusion of gang vocals and a huge pre-chorus takes everything to the next level. Throughout the number, there are suggestions that the bass is furiously pumping, but an aggressive drum part and a wall of guitars seem set to leave the strongest impression. This could easily be a leftover from the previous BPL release – the band are sticking to strictly familiar territory – but it’s none the worse for that. For those looking for something more melodic, the mid-pace of ‘One Last Night‘ should please with influences from bubble gum rock and power pop, as Baker (re)tells a tale of a relationship about to come to an end. With huge chords, a variety of surprisingly melodic soloing and a band steadily working through their own take on influences from The Scruffs, Nerves and Pezband, it’s got a great pedigree…and a chorus so infectious, you’ll be hitting the repeat button fairly swiftly. ‘Take It Or Leave It’ falls squarely between the two main musical camps, promising hefty rock ‘n’ roll during its opening riff – with yet more piano – before falling away to reveal the kind of hooky melodicism that sat at the heart of most of Baker’s own ‘Play It Cool‘ LP. While there’s an underlying feeling that the guitarists are happiest when tearing through a riff or six at maximum speed, this number has just enough crunch within its retro pop to please the riff junkies, while showing off Baker’s traditional power pop chops. Having already shown an “all killer, no filler” aesthetic, ‘Radioactive Love’ closes the record with yet more pop-punk sharpness and a two guitar assault that never lets up from the start. Spiky vocals are bolstered by cheeky harmonies, while the rhythm section of Joseba Arza (drums) and Gonzalo Ibanez lock into one of the album’s fiercest grooves and – for one last time – a retro guitar adds a scorching lead break. Just for once, Bullet Proof Lovers don’t quite hit the mark when it comes to the chorus, but with speed, enthusiasm and sheer guts, they’ve got everything else on their side. It’s fair to say, if you’ve ever had any interest in either Kurt Baker, classic punk pop or high octane new wave rock, this release has all the bases covered. 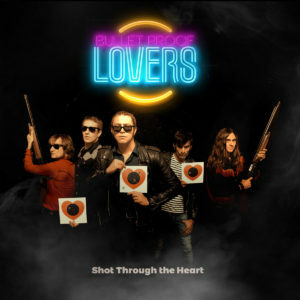 Twelve songs that buzz past in the blink of an eye, ‘Shot Through The Heart’ is set to pierce through the ears of all lovers of retro, high-speed rock in all corners of the US, Spain and beyond. This entry was posted in Album & EP Reviews and tagged bullet proof lovers, kris rodgers, kurt baker, power pop, punk, punk pop, rum bar records by Real Gone. Bookmark the permalink.